Below are some blouses and sweaters from J.Crew that are currently topping my wish list. Last week I mentioned that I would be sharing some AMAZING deals via GroopDealz each week in an effort to help you look fabulous for less over the holidays. Below are three of my favorite accessories currently available for under $6.00! love the jacket with the shirt! NIce outfit! love the booties. Today I show you a Comfy but Chic outfit with a paillettes top and an amazing pair of Jewel Sandals!. This ensemble is so cute, love everything aboutit. i recently did a post with a plaid shirt too! i love all the different ways you can style them, so versatile! and i just love everything about this outfit, super cute! Amazing outfit. Love that top with the pretty white skirt. You look fabulous. Nice outfit! Love the white skirt!! I like the combo of plaid and white. Awesome outfit, and love the JCrew sweaters! You look amazing. I love the layers and LC booties. Love everything about this outfit. Very holiday. I love the look! The shirt and the blazer are gorgeous! 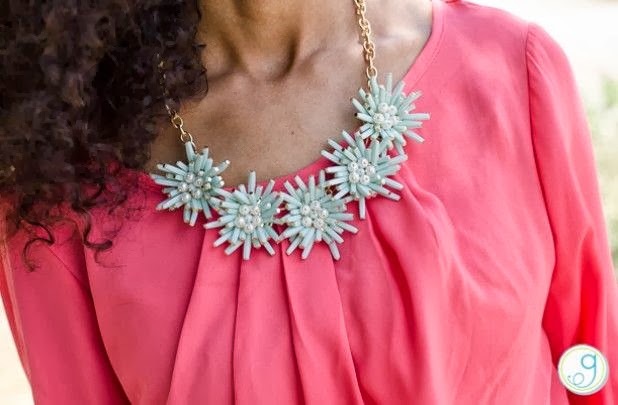 I love that j.crew top! Very stylish look! Love so much that skirt! Love this outfit. Great skirt. Love love this outfit, you styled it perfectly!!! Loving the plaid with the white skirt! Love the plaid top with the blazer! Great combo for sure. u look great and i loved everything in this pic blazer, shoes,rings everything. Girl, you nailed this look!! That skirt!!! I would have never thought to wear it this time of year, but you made it perfect for fall...so classy and fun!! SWOON!!! Love this look! And your background could not be more perfect!!!!! I love this, the combo with the white shirt is perfection. Loving the outfit.. I know NOTHING about fashion and would be perfectly happy with flip flops year round in Florida but I just don't get those colored shoes or the styles :) But that's just me. I love that checkered top, so pretty! Also, those number rings?! I need them! Very cute outfit girl! You look fabulous! 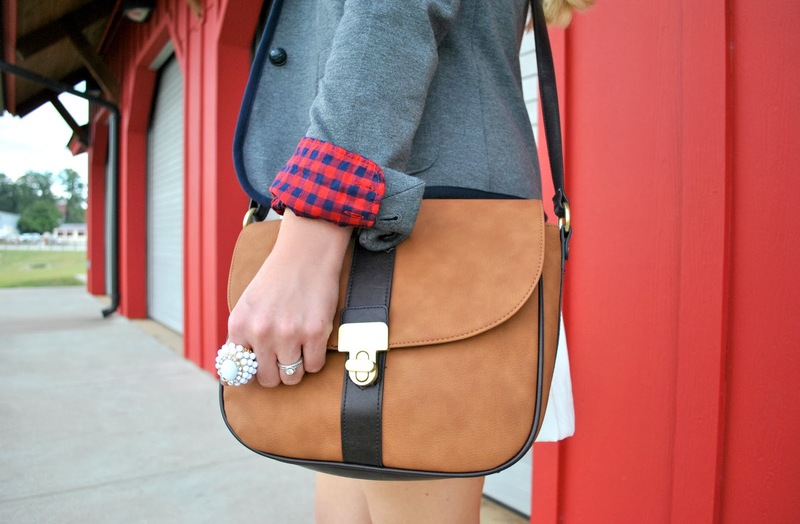 love the plaid - such a chic fall look! those boots are awesome too. Love your outfit. The plaid is so pretty with the blazer. I'm loving the grey J Crew sweater. Totally on my list to buy. So gorgeous! I love this look Anna! I love this look!! very chic plaid! I love this outfit! The blazer and the plaid shirt are great together! I love everything about this outfit! You inspire me every time I'm stuck trying to put together an outfit. This is such a chic outfit! I love plaid. You are looking incredible! I am in love with the plaid accents. Such a chic look. You're so stylish!!! Very sweet rings and your skirt. Oh my gosh I LOVE this outfit! I am completely obsessed with white this fall! love when someone shows me how to transition white into fall! and I am drooling over that blazer. I love the way you've styled plain in this outfit! I would have never thought it would go with a classy white skirt. I'm all about jeans, but this I have to try! 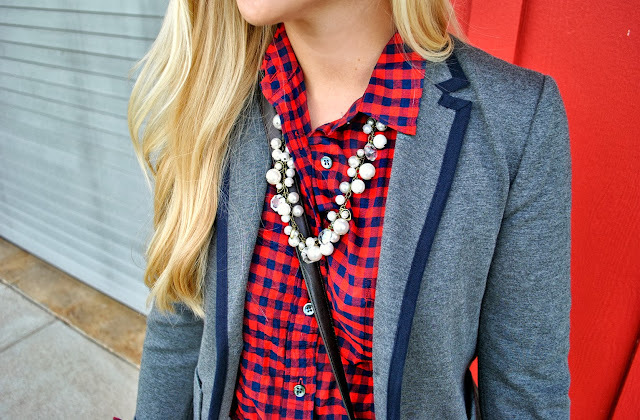 I love the blazer over the checked shirt. I'm totally pinning this outfit for later. The location that you chose for the backdrop complements the outfit perfectly. Loving the plaid! So cute! Your outfit is perfect, those boots are amazing. 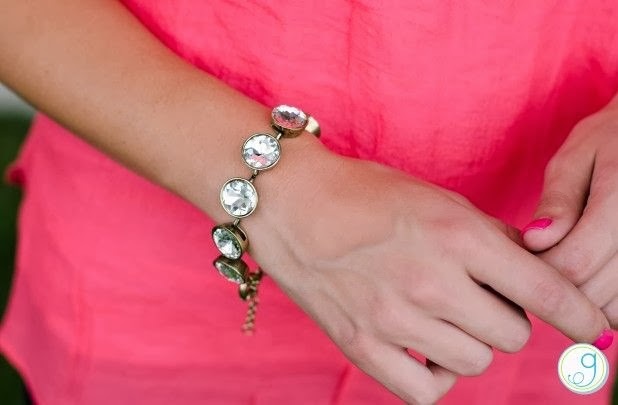 I love that last bracelet you posted and it's such a bargain. Thanks for sharing GroopDealz.com I hadn't heard of them before but I can already tell they're going to be my new favorite site. Love this! Your top.. super cute!!! This is one of my favorite looks. Gorg. Love the blazer and the cute satachel! Can I just say I'm in love with our outfit! It's so cute and classy! You are so awesome! You inspire us and your blog is adorable. love your outfit. pretty and cute. also really loving the camel jcrew sweater in your selection. I live how affordable this look is. It makes it even more fab. This whole outfit is fantastic, I love the combination of checked with white and grey! Also, love the second sweater!! Love your rendition of the checked trend, you look so effortlessly chic! Adore this outfit. Preppy chic. Wow! Amazing post, I love the check print and number rings! very cute mix of dressy and casual! that grey printed jcrew sweater is at the top of my list as well! What a fab fall look, love all the different textures in this look! I love this outfit! I just love gingham! 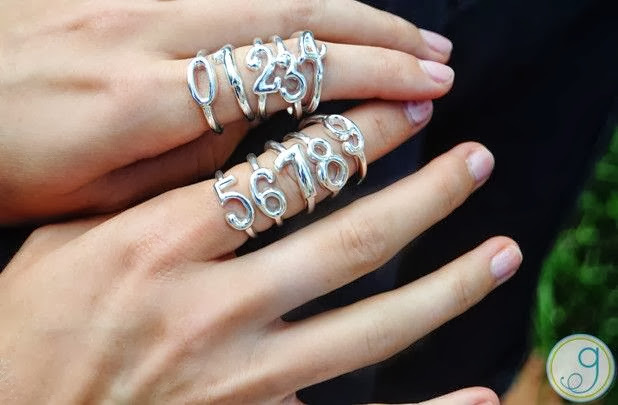 Those number rings are fabulous! The number rings look fantastic!!! So adorable! Also, I love the way you layered your outfit with the plaid, great mixing in this outfit. The bright and colorful plaid add the perfect pop to the other neutrals pieces in this outfit. And ohh my goodness am I loving those boots!! the jacket&shirt match is perfect! 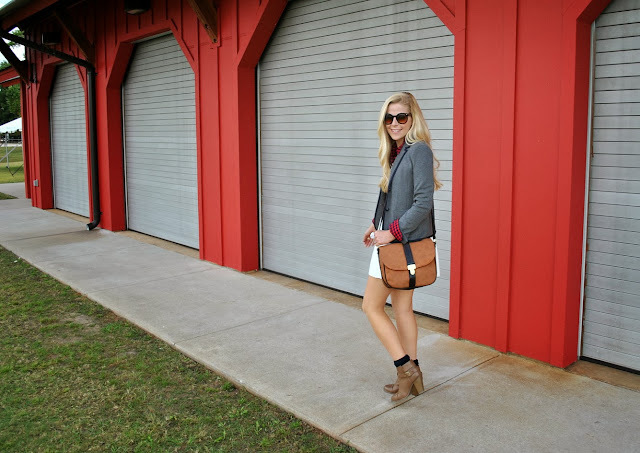 Instantly pinned this, perfect fall look! Absolutely adore this outfit! We certainly are obsessing over fall plaids on Confessions of the Glitterati... check out my latest post wearing a plaid pencil skirt! Love your shirt and blazer. You look beautiful Anna! Thank you for ypur comment dear! you look adorabe! What a super cute way to wear plaid! I love it with the white skirt! Thanks so much for visiting my blog! I love this look! Your skirt is timeless. the picks are to die for! Ana, this look is amazing and you look gorgeous as usual. Love, love, love! Ana, you look amazing as always. Love the top so much. Definitely one of my favorite looks from you! Such a beautiful look! I love how you styled it and you look fantastic in it! I especially love your shoes :) Perfect for the season! The red plaid looks a little like tartan dressed up like this! Totally adorable! I like how you went ultra femme with the plaid by pairing it with a full skirt and blazer :). The booties are the perfect finish! I love when you mix more girly pieces with more masculine pieces! I love the jacket and shirt combo! This is a super cute look. I wish I could figure out how to make my cuffs stay like that...it'd be useful for when it's warmer. You can never go wrong with J. Crew, amazing outfit dear!! Super cute outfit and blog!!! I am now following your blog :) absolutely adorable!! !